This entry was posted on Saturday, December 22nd, 2012 by Frances Ryan. I’ve decided to spend Christmas alone this year. I know that sounds silly to some people, but it seems like the right thing to do for me; for my heart. It’s not that I’ve not been invited to spend the day with others; it’s just that it’s hard to spend such a special day in someone else’s home. I would be left feeling like an outsider; like I was there because someone took pity on me. I know that the people who’ve invited me wouldn’t feel that way, but I would. And I’m afraid that would be hard on my heart, so I’ve declined the invitations in favour of spending the day alone. Part of me knows that the best way to make it through the day alone is to pretend that the day isn’t happening but, at the same time, I know that my heart and soul will know what day it is no matter how much my brain tries to ignore it. So, I’ve decided that I will enjoy a Christmas feast, just like I would do if I had someone to spend the day with. Only, I had a bit of a melt-down in the shops today when I tried to buy groceries (seeing those happy couples still hurts!) so I have to go back and try again tomorrow. 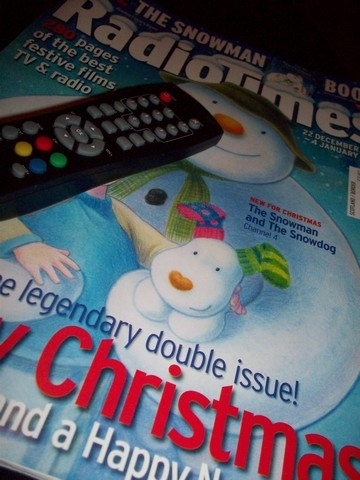 But, thanks to a co-worker, I do have a copy of the Christmas Radio Times so I can start planning out my Christmas day viewing. Doctor Who and EastEnders are already circled! Yes, I’ll be alone for Christmas, but I will survive it. Just like I’ve managed to survive every other day. And hopefully, I’ll survive without too many tears. After all, I have to carry on, and this won’t be my last holiday alone. So I might as well figure out how to manage.